Zeeburg is a relatively new district, and still expanding. Located by and on the IJ river, it includes a number of small artificial islands and peninsulas, and takes its name from the island of Zeeburg in the centre. Zeeburg does not have many green spaces. IJburg is a new, middle-class neighbourhood that is still under construction. It consists of six artificial islands on the IJmeer (IJ Lake): Steigereiland, Haveneiland and the Large, Small and East Rieteilanden (Reed Islands). Four more islands are planned in the future. Homes for a total population of 45,000 are planned for the future in IJburg, as well as schools, restaurants, shops, and cultural districts. A surprising number of artists and other creative types live in the grimly named Oostelijk Havengebied, or Eastern Docklands. Its name recalls the time when most residents were employees of shipbuilders. The neighbourhood has since been redeveloped and now has a lot of restaurants, shops and cultural institutions. 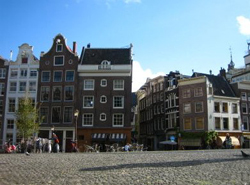 Many are in the Levantkade, Azartplein, Veemkade, Oostelijke Handelskade and Cruciusweg areas. The residents’ artistic creations can be found both in the Docklands’ galleries and in the streets. Live music performances and festivals frequently take place there as well. The Indische Buurt, or the Indonesian Ward, has a high immigrant population and is a working-class neighbourhood. Its streets are named after places in Indonesia. Divided into West and East sections, Indische Buurt is the oldest part of Zeeburg, having been populated since the early 20th century. In the 1980s and ‘90s the sector underwent urban renewal, and much social housing has been converted into houses for sale.